MIAMI – The PlusUrbia Design and Perkins+Will team will lead a major community workshop to help plan a bright future for Coconut Grove that retains its many unique and positive features while addressing its need to balance vitality with quality of life. The workshop will begin at 9:30 a.m. Saturday July 29 at 2982-B Grand Avenue (between FedEx and 24 Hour Fitness). 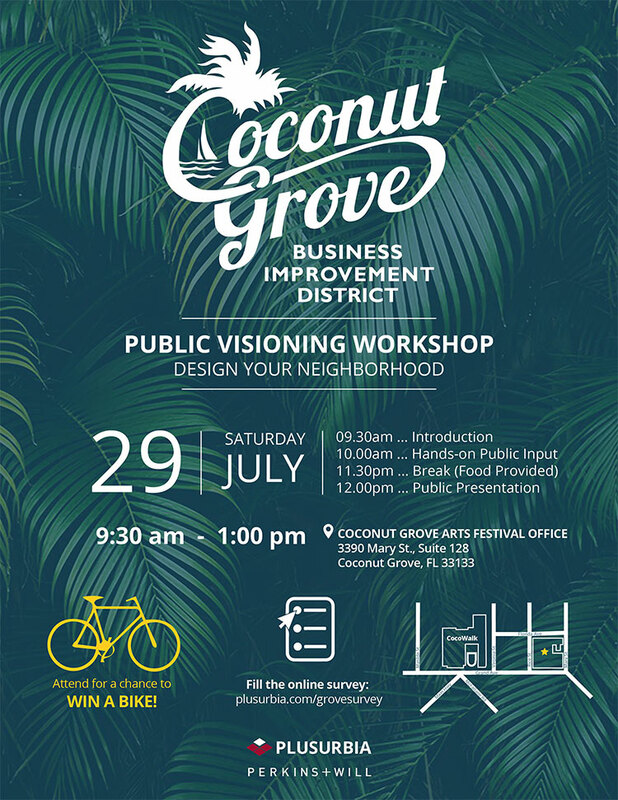 In collaboration with the Coconut Grove Business Improvement District, The PlusUrbia-Perkins+Will team is leading a master planning effort to improve and enhance Coconut Grove as a healthy, prosperous and desirable community. The Saturday event includes: an introductory presentation at 9:30 a.m., hands-on public input at 10:00 a.m., a break with food and drinks provided at 11:30 a.m. and public presentations at noon. Coconut Grove is a culturally-rich and historic neighborhood that is one of the most desirable places in all of South Florida. This planning effort aims to enhance the commercial core that serves as the Grove’s economic engine, destination for dining, shopping and entertainment and thriving heart of the community.